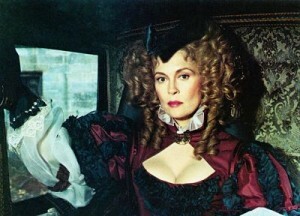 Faye Dunaway (Chinatown) stars in 1983’s bawdy period adventure film The Wicked Lady. Lady Faye is Lady Barbara Skelton, a beautiful socialite in 17th Century England who finds her life extremely dull in spite of being married to a rich man (Denholm Elliott, Trading Places). In order to escape her banal existence, Barbara begins an affair with a miscreant criminal, Jackson (Alan Bates, The Rose), and together they enter into a life of crime as highwaymen (er, man and woman). And so, as Barbara masquerades as a bandit by day, she must uphold her duties in the social hierarchy by night. A remake of the 1945 classic starring Margaret Lockwood, The Wicked Lady is often cited as one of the most deliciously bad films of its time–which probably helped inspire its cult reputation. Directed by Michael Winner (The Mechanic), it even goes so far as to include an highly charged whipping scene between Dunaway and Marina Sirtis (Commander Denna Troi of Star Trek: The Next Generation). The supporting cast includes Sir John Gielgud (Arthur) and Prunella Scales (Howard’s End).